What Price Customer Loyalty? As You Sow, So Shall You Reap…. Customer loyalty is a very interesting concept. Customer loyalty can be earned, and bought. But is it ever owned? For an organisation, for a business, there will always be a point, a tipping point, where customers will begin to question the value that they receive for their loyalty. Customer loyalty can be bought, and earned. And it can be lost. Or lost over a series of events. A good dental friend of mine talks about the triangle of business. He says no business can provide all three. He says one always has to be surrendered. If a customer or client wants great quality and great service, there will be a price. If a customer is willing to sacrifice service, or quality, then the fee, or price can be lowered, usually. Similarly, for a business, a reduction in their fees and prices will result in a reduction in their profits and margins. For the business to maintain a viability, it must then look at a reduction in the level of service it provides, which costs, and/or a reduction in the quality of products it offers. The cost of service is reflective in the number of staff employed to provide the service, as well as their experience, and also their levels of specialized trainings and ongoing trainings. Costs of products is easy. Businesses can source less expensive, lower quality alternatives. They can also try to “extend” the life of certain replaceable items they use in their business. Or businesses can cut the item from its use in that business. But there’ll be a time when loyal customers will notice. And when they notice, those businesses had better be prepared for a loss of clientele, because those loyal customers will walk, and take their business elsewhere. So think wisely, if you are in business, as to whether your clientele will notice your changes. Accruing points and miles is an absolutely useless and pointless exercise if the redemption of those miles is a painful and unpleasant and insulting process for the loyal customer. In my mind, the points and miles have been earned and purchased and paid for. Airlines need to show Frequent Flyer Miles in their Balance Sheets. Booking airline flights with points should be just as easy as booking paid flights. After all, the miles, or points, have already been paid for. But when one airline views its flights booked by points as an encumbrance, or burden, it really shows when it stacks up against another airline that welcomes points purchases, and looks at these purchases as an opportunity to sometimes acquire a customer. Recently I had great difficulty booking flights well in advance with my regular airline. They offered me long routed, multi stop itineraries. Fortunately, another airline, which I had not ever used, *yet*, welcomed my points and miles. With several options and direct routes. The difference was chalk and cheese. Sadly, in the real world, my first choice airline is doing it tough. Paper towels instead of cloth towels. Packets of chips instead of warm prepared snacks on overnight long haul flights. And it’s this decrease in quality, and reduction and stretching of services, that’s causing me to question the value of my loyalty to them. I’m looking forward to seeing the level of service I receive on my reward flights with my new carrier…. Now I’m a long-term frequent flyer of considerable status with the “old” carrier. But I’m thinking, well it’s about time…. We’ve all been to restaurants where the service is bad. But what do you do when it’s one of your favourite regular places? Sometimes the variance in service can purely be due to an “off day”. But an off day is not what customers want. Customers expect *best* every time. So what do you do if that happens to you? Many customers will take their business and patronage elsewhere after being the recipient of only one off day. Other customers will give the restaurant another chance. Is the lesser customer experience due to one team member, and is it their attitude, their skill, or their level of preparation that lowers the customer experience? Or is the lesser customer experience a result of a directive from management or ownership, which is then filtering down to the front line? In this case, the staff and employees are merely pawns in the game being played by management. And so it’s not really the fault of the staff. But they have to bear the brunt. The brunt of complaint or question about policy. A good customer will recognise the difference when their expectations are not met. Whether the customer chooses to accommodate those differences, or reject them as being unacceptable, well that’s the gamble that businesses take every day. In dentistry, your loyal patients will know when your Office starts cutting corners. Your customers will know when your quality of materials and purchases is reduced. Your loyal clients will know when your new staff are under-trained in customer service. Sure, in any business or profession, staff with bad attitudes can drive loyal customers away from great businesses. Likewise, policy, and change of policy, can drive loyal customers away from great businesses with great staff. Yes. I know. Businesses do need to make a profit. Without profit there is no business. But what profit? And how much profit? Sometimes profit forecasts need to be tempered during tougher times. In farming, you sow and you harvest and you reap. You cannot reap every season. If you plant inferior seed, you will reap inferior crop. If you plant good seed, but tender it poorly, your amount of reap will be lowered. If you employ poorly trained and lazy farm hands, your yield will suffer. Good seed, good farmhands, good tender, yields good harvest. Invest in the seed, invest in the labour, invest in the equipment. And you shall reap loyal customers who want your produce. In farming, if you cut corners, you do so at your own peril. In all business, it’s the same…. Just heard author and blogger Jon Acuff say this. And it hit a note with me because I was thinking earlier this morning as to what I could blog about today. The reason I was thinking about this was that at present, I’m in my second last hotel on what has been a long forty-three night trip away from home. Well actually, it’s the third last night in a hotel. And I’ve got to say, one of the really big things I’ve been taking notes on on this trip is the quality of the hot showers and the fluffiness and newness of the bath towels. And the quantity of bath linen. Now when it has come to showers on this trip, let me say, most of the showerheads, except for two, have been lukewarm dribbles. Hardly enough water and pressure to wash the froth out of your coffee cup, let alone the soap from under your arms. Now, for those who know movies, I like a shower to feel like the police cell scene in First Blood, where John Rambo gets a hosing down. So every time I have to run around in the shower to rinse the shampoo out of my head, it kind of makes me feel like these hotels are just a little bit tight. Now maybe it’s the local city council regulating the water and the showerheads…. I don’t know? But I’ll say this. The best pressure by far was in New York City, where last time I looked, they have a fair few people living there. The second thing that really says *MEAN* to me is the quality or age of the bath linen. And about half the hotels have had towels that were past their used by date when it came to luxury and fluffiness. After you’ve taken a hot shower, there’s nothing worse than trying to towel yourself dry with a piece of glorified cardboard dressed up as a bath towel. And it says: *Mean* !! We all know how luxurious we feel when we can wrap a fluffy fresh towel around us after a hot shower. So why do hotels stretch the envelope when it comes to bath linen? It seems to me that it’s a no win situation. Why not make every towel as good as it can be? 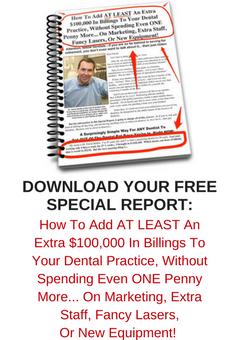 What I’ve been talking about here is an important key principle when it comes to looking at your dental office. What messages of *MEAN* are you sending out to your patients and customers? Do you use rough tissues from a generic brand? Or luxurious thick soft name brand tissues? Or better still, warm heated towels? Do your clients get espresso coffee? Or just plain instant? Are your pens fine writing utensils? Maybe with your office name and contact details? Or are they a hotchpotch collection of some that work and some that don’t? Do you have fresh flowers in your client lounge? Is your client lounge furniture comfortable or is it more like a bus station seat or a park bench? What messages are you sending subliminally to your customers? Remember, the degree of care you take in choosing your services and furnishings will prepare your clients for the quality of their Dental Experience. And you can’t be World Class if you’re saying *MEAN*!! Sending the correct messages is just one of the parts of The Ultimate Patient Experience, a simple easy to implement system that I developed that allowed me to build an extraordinary dental office in an ordinary Sydney suburb. If you’d like to know more, ask me about my free special report. Whenever my wife and I visit New York City we love to dine at Balthazar Restaurant. Not only is the Classic French Bistro food just the best, but also the wait staff are well trained in the art of offering professional World Class Customer Service to their patrons and diners. I realised on Friday, when I was there once again with my wife, that they are indeed the masters of Customer Satisfaction when it comes to dining reservations. What Balthazar do with their bookings is ingenious, and should be a lesson for all restaurants as well as a lesson for all businesses making appointments, including Dental Offices. One of the Number One difficulties Dental Offices have in their day, every day, is the ability to manage the Appointment Book in such a way that it is productive and profitable, but also accommodating if needed. I’ve seen clients, and non-clients alike, struggling with the set up and layout of an appropriate appointment book template for their offices that reflect comfort throughout the day for doctors, team and patients. Such days rarely result in a productive day being achieved for the office. Moreover, days resemble a scramble more than they do a template. We’ve covered this topic before in previous blogs. The best way to reduce stress and create productive days is to plan and template the day. Sadly, I still see appointment books that are “stacked”. Patients and appointments are just piled one on top of another from day’s start, with little or no regard for doctor flow, patient flow and instrument flow. The best way to create happy patients and happy team members, and happy dentists, is to template the day, so that there are spaces for various and different procedures. There also needs to be an alignment between the doctor’s book and the hygienists’ books. Space, or available time needs to be kept open in the books each day for same day appointments. New patient same day hygiene spaces. Relief of pain same day dentist spaces. Keeping these spaces open each day until that day, and not giving them away prior, no matter how tempting, is the easiest way to grow your dental office. Providing this service creates valuable, appreciative customers. Like I said, it was at my recent visit to Balthazar that I saw this same principle working at it’s best. Long story short, but last Friday, my wife and I ended up with an evening free on our current trip to New York. We had planned to lunch at Balthazar later in our visit. So on Friday afternoon, around 4:30pm, I called them, on the off chance, to see what the lay of the land was for that evening, and whether they could fit us in. On previous visits, we had often just turned up, without a booking, and waited, and been seated, after spending some time at the restaurant bar. So on the phone we were told that the restaurant was fully booked. However, I was told on the phone, that if we’d like to come early and wait in the bar, a table may become available, and we may be able to dine. We were geared for an early dinner anyway, so we headed up to Balthazar. Upon arrival, our name was taken, and as expected, we were directed to the restaurant bar area. And it was here that I noted Balthazar’s scheduling magic. You see, the restaurant was empty. It was 5:35pm and all set for the evening’s booked patrons, who would begin arriving at 6:00pm. However, the bar area was packed. There were patrons seated at the bar, as well as other patrons standing deep there as well. Around from the bar were several two seater tables, where diners sat….. This section was the Balthazar equivalent of the Dental Same Day Emergency Appointment Time. Balthazar had templated their floor layout!! This side section, beside the bar, was kept for same day diners, who were willing to turn up and just wait. On the understanding that they will be seen, eventually, but without disturbing those diners who had booked in advance and were seated comfortably away from the bar area. In so doing, Balthazar always guaranteed themselves a full house of diners. Because heaven forbid if there were any no-shows in the main dining section, they could easily be replaced by any of the many gathered waiting in the bar area. And those waiting in the bar area are often enjoying a pre-dinner drink or two, and adding to the “collections and production” of the restaurant. Now if this section of Balthazar was *NOT* present, then a couple of things would happen. Firstly, as stated above, there would be no reservoir of patrons to draw from to fill unexpected no-shows. Secondly, there would be no pool of happy customers to add to, or build upon, as a growing database of satisfied clients. Without this side area, prospective callers and diners would be sent away. Every diner we spoke to that evening was appreciative of being able to be seated in the side section. Happy customers. Either new visitors to Balthazar or on a return visit to the restaurant. And from out of town. Or like us, from overseas. Templating your appointment book for maximum benefit to all is one of the straight forward lessons you’ll learn in The Ultimate Patient Experience, a simple to build complete Customer Service system in itself that I developed that allowed me to create an extraordinary dental office in an ordinary Sydney suburb. If you’d like to know more, ask me about my free special report. It was a patient, who uttered these words to me, a long time ago. I was working as an assistant dentist. In working class Western Sydney. 1984. Three years before I bought my dental office. Dentistry, too, is primarily a cottage industry. Not that it’s people working part time from home. More so, it’s a business built on relationships rather than on commoditisation and on mass production. Though commoditisation of the profession is happening. Now, a sure way to guarantee a path to the poor house is to operate your dental practice with total disregard of the principles of business. I’m not advocating total disregard. And it needs to be treated like a business to be successful. There are certain parameters and measurements and metrics that need to be collected. What gets measured gets repeated. And without measurement there is only guess work. And not measuring *anything* is a sure fire pathway to mediocrity, struggle and failure. But sometimes, in dentistry and in business, there are intangibles. And sometimes we need to trust our gut feeling. Because overlaying an ROI mentality onto everything that moves and breathes, is just sheer stupidity. In dealing with ROI, or return on investment, of Customer Service, or more importantly, World Class Customer Service, the measurement of reward or return is an intangible parameter. What is a smile worth? How do we measure the return on a smile, a laugh, a wink or a nod, during a conversation with a client? Or the return on the impression a client or customer receives when they see a businessman in a fine tailored suit? How does big business measure return on investment on those things? In dentistry, despite the fact that the *doing* of the dentistry is mechanical, there is in fact a strong overlay of personal, of human relations. And big business, and corporatisation often don’t get that. Sure, there is a market out there for mass production. And give the masses mass production and they’ll take it, sometimes because they don’t know any better. Or that better, and best, exist at all. How do you measure ROI on word of mouth? And the intertwining of word of mouth with measurable marketing? Or even new marketing, and new media? Because sometimes “marketing” as such, is a leap of faith. What is a patient in your practice worth, really? What’s the average dollar value of a new patient to your office? What does a new patient spend, on average, first visit? Or in their first month? Or first three, or six months? What’s the dollar value of a new patient in their first twelve months in your office? Or after two years? Three years? Or Five years? What’s the dollar value, or average spend of a patient who has been coming to your office for ten years? And what percentage of your new patients reach those milestones? One year, five years or ten years? More importantly, where did they come from? How do you measure whether they kept coming back because of something that was said, or done, that made their day? In the same way, how is a dentist to know what to do, sometimes, in business as well as in dealing with patients. What should I invest in to attract more new patients? And what type of patient? Would you invest 30-40% of what a patient spends to attract a new patient? But would you keep paying 30-40% of every dollar they spend just to keep that patient? Yet that’s what some dentists do when they hop into bed with third parties, like insurance, and preferred provider plans. These dentists confuse activity with results. Better to be busy, on low or no margins, than to take time, and spend time, they say. Omer Reed told me a few years ago that with regard to Dentists in the USA, at age sixty five, 95% of those dentists reaching that age are not able to retire, or walk away, if they so desire. Nineteen out of twenty dentists reaching age 65 still need to keep working for financial necessity. And yet nine out of ten dentists will say they don’t need a coach. Nineteen out of twenty will say they don’t need advice. Nineteen out of twenty will do what most other dentists are doing. Well clearly, that’s not working for nineteen out of twenty. How does one dentist know to hire in outside advice? Or how does one dentist know to invest in a marketing campaign? How did one dentist know to be the first dentist in a big advert in the Yellow Pages? What’s the ROI from doing an advertising campaign? And is a billboard or signage placed strategically acting subliminally, along with other marketing, to attract more patients, or quality patients? And at what point is ROI on a campaign immeasurable? Like building a house, or taking a vacation. You pay up front before you get the product. Yet you can’t measure the ROI on living in a new house, six months, one year, or ten years down the track. What did that investment do for your state of mind? Six months, one year, five years later, what did that *experience* do for you? Do those memories bring joy? Do they lift you? Is a smile, a warm touch, a kind gesture a tangible, measurable product? What is the true ROI there? Sometimes the return on investment does not rear its head until many years later. And the investment may only be a simple act of kindness. Or a leap of faith. Not acting kindly, and never taking leaps of faith are a surefire guarantee of no success. Are a guarantee of mediocrity. You must trust the intangibles. Give, and you will receive. Connecting, and other intangibles, and their intrinsic values, are just some of the parts of The Ultimate Patient Experience, a simple easy to implement system that I developed that allowed me to build an extraordinary dental office in an ordinary Sydney suburb. If you’d like to know more, ask me about my free special report. There are some things in business that are difficult to measure. There are other things that are easy to measure but are not measured. Although these are difficult to measure, they are very important factors that need to be observed and considered in creating and monitoring the status and progress of any business. It’s been said many times. The older I get the more I realise how much I flew by the seat of my pants in my early days. More and more, now, I realise how much I have learned along my business journey. And the value of that knowledge…. Many years ago I watched a law firm purchase a very successful local real estate agency branch office. The plan was that the law firm would receive conveyancing and other legal matters from the real estate business. Directed to the law firm. The real estate business did not prosper. I’m not sure why. It may have been due to the fact that the new owners were not on the shop floor selling real estate. It may have been because the new owners were not even real estate people…. In hindsight, the lawyers told me that purchasing that agency had not been a good decision. A better business outcome may have resulted had the lawyers maintained a working relationship with the previous owners of the real estate agency…. An internal business culture that other businesses envy. And it is created from high up within. For great culture to be developed within an organisation, there needs to be strong leadership. That gets seen and eaten and breathed in by the organisation, by the employees. Without an internal culture, you only have, at best, a skeleton. And your clients, customers and patients can feel the heart. And they can feel when there is no heart. Client satisfaction and employee satisfaction. Employee satisfaction comes hand in hand with culture. A great organisation with great culture has employees with enormous job satisfaction. I’ve visited Zappos. I’ve visited Warby Parker. And Disney. These are truly wonderful places to work at and the employees reflect on that culture. They love to work there. Satisfaction just radiates from them. Similarly, as a customer of these three businesses, I am one very very satisfied client. Who’s on top of the wisdom, culture and satisfaction indices in your Dental Office? Your clients and patients will pick up on and soak in all the positive changes at your Dental Office. They know when your culture is on fire! They admire your business wisdom. And they love dealing with satisfied employees. In running your Dental Office, you need to fuel the culture. And grow your employees’ hearts.